“Having a sprinkler system installed is like having a firefighter based in your business around the clock”. These are the words of Hampshire Fire and Rescue Service’s Group Manager Tony Deacon who is urging shops and offices to protect their premises. His appeal comes after a blaze at the Marks and Spencer store in West Quay shopping centre, Southampton, where the sprinkler system meant the fire that broke out in a row of industrial refrigerators only damaged two items. Without this safety feature, he says, the entire row of 20 products would have probably been destroyed in addition to potential damage to other stock and a possible costly closure to the store. 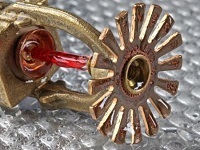 He said: “People understand the idea of using sprinklers to protect lives, which they do, but more businesses are starting to understand they can be a vital tool in safeguarding a company’s stock, equipment and property – and ensuring business continuity. “Some firms look around their offices or shop and think it is not worth the expense without thinking of how much it may cost if company is unable to operate in the event of a complete loss. The fire broke out inside a refrigerator in the store’s food hall at on New Years’ Eve last year and involved five engines, specialist vehicles and about 25 firefighters from across the county. Four sets of breathing apparatus, two hoses and tactical ventilation was used to battle the blaze which was extinguished in a little less than an hour. GM Deacon said this could have been much worse if the store did not have an effective sprinkler system in place. He added: “There is a false myth surrounding sprinklers perpetuated by films which show them flooding an entire building because somebody lights a cigarette. “They have an extremely localised range and can be set to trigger at a variety of different temperatures depending on the nature of a business. “In the case of a serious fire sprinklers may not extinguish it but they will contain and limit the blaze as well as bringing down the temperature to allow firefighters to enter more quickly and with more confidence. “It is very sad when, as a firefighter, you see a business destroyed beyond repair and know the difference that the immediate intervention of a sprinkler system would have made. “In a lot of ways the new ultra-high pressure lance is a mobile sprinkler system." A Hammerson spokesman, who set up the West Quay shopping centre, said all of its developments have sprinklers. She said: “In high footfall areas such as shopping centres, it is essential that measures are put in place to protect the well-being of our customers and staff, and also to protect the building itself.